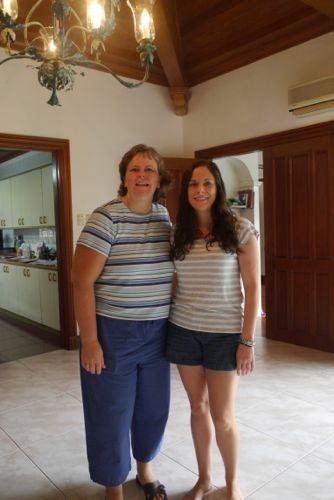 We made a brief stop in Manila and had the treat of staying not at a hotel, guesthouse or hostel- but at a home with family! 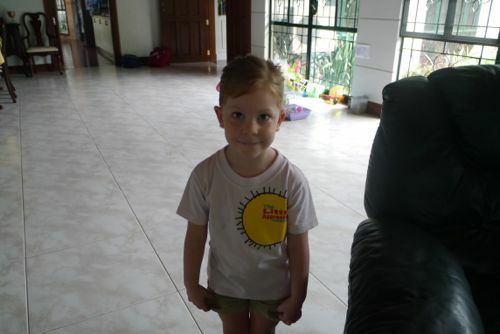 My Mom’s Dad’s Sister’s Daughter’s Daughter is Susan. 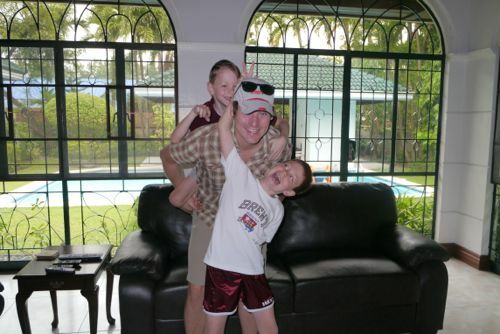 Susan is married to Greg and they have 3 kids, Scott, Ryan and Ashley. 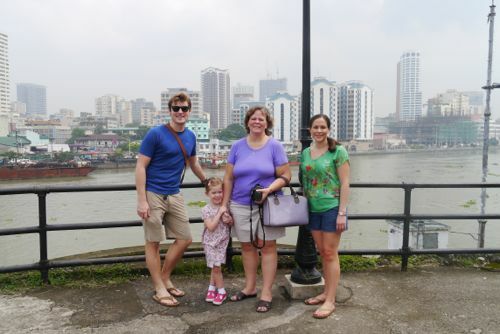 Greg is on a three-year work assignment in Manila and of course the family came too. They are living an expat dream in the tropical Philippines. Well I’m sure some days it’s not a dream- but undoubtedly always an adventure. We had a fantastic time with them. The next morning Susan had planned a fun filled day. 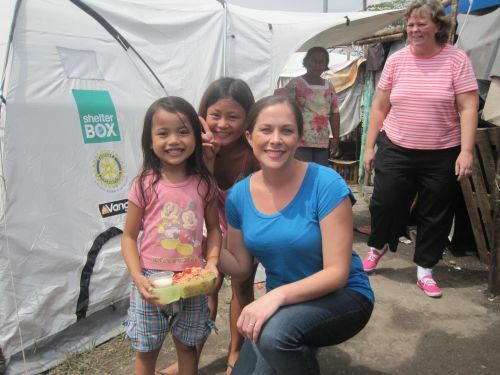 After the boys took the bus to school and Ashley was dropped off at preschool, we headed to a friend of Susan’s house where the Alabang Ladies International Group that Susan is a part of was preparing food to serve to displaced flood victims. 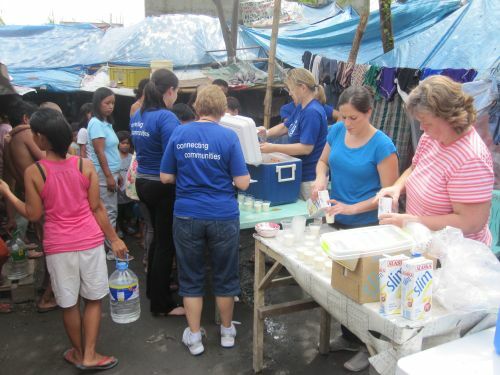 This group of ladies does this three times a week and serves hundreds of families. 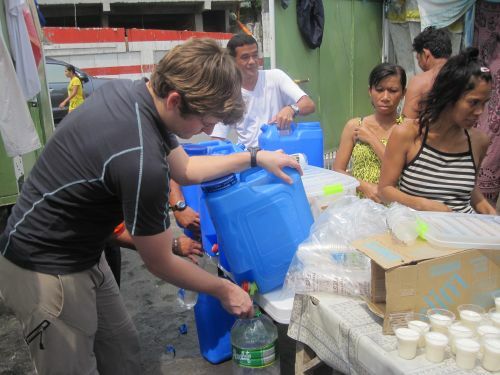 In addition to a hot meal and milk for the kids, they bring their fresh water jugs full of clean water to distribute to those in need. It was an awesome group to see in action. Once the food prep was completed, we loaded up and headed to the first site. 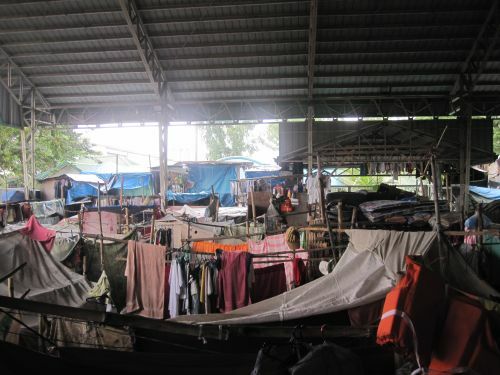 We walked through the tent city housing thousands temporarily constructed on a basketball court. Blankets hung to create divisions of space. Adults and children could be seen through the shadows sitting on the floors of their tiny “homes”. When the food arrived, the people knew the system. Everyone lined up with their plates and bowls and we filled them. The second site was even larger. Children and adults poured out to line up for food. We met a lady whose latest child had been born in this tent city after the flood. 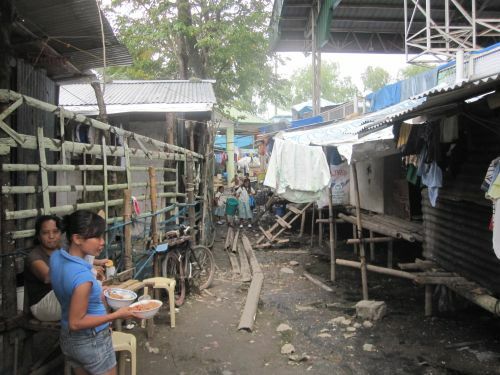 When you see the overwhelming needs in some places it’s hard to know where to begin helping. Fortunately groups like ALIG are making a real difference in hundreds of lives every week by making the effort to do what they can. Back at the house, Susan had stocked their kitchen with tons of funky Philippines food for us to try. With three young kids we know experimental eating is not their top priority, so we really appreciated it. Things like prawn crackers and ubi buns are commonplace in the Philippines. Susan also introduced us to some of the tastier treats like ensaymadas- a sweet pastry and calamansi fruit juice- which looks like a lime but has a tangy sweetness. The malls in Manila have everything. You can seriously go to the dentist, buy groceries, sing karaoke, eat a nice meal, have plastic surgery, attend church, get your nails done, buy clothes and ride a rollercoaster all in one place. 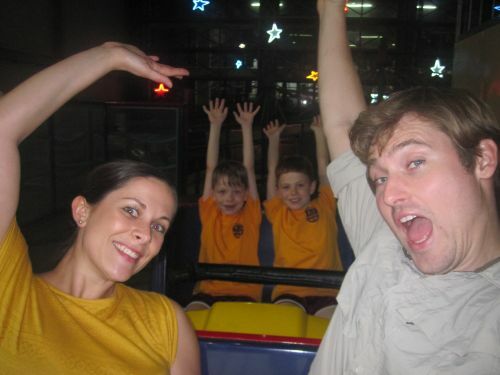 After the boys got home from school we all went for a ride on the nearby mall’s indoor rollercoaster. 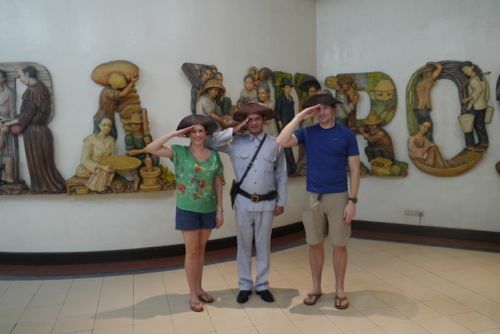 Our last day in town Susan and Ashley took us to Intramuros to take in some Philippines history. 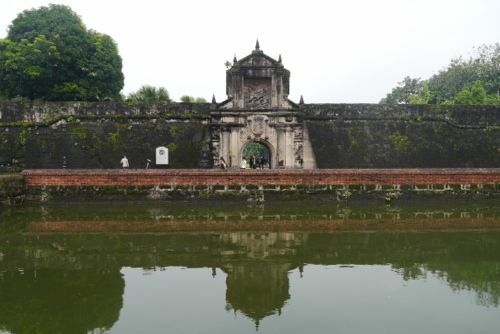 Intramuros, which in Spanish means “within the walls”, includes the remnants of the old walled Spanish settlement. 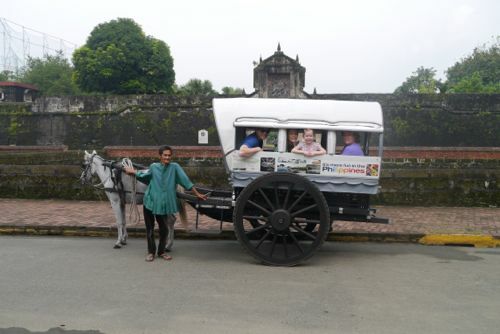 We went on a guided tour that began and ended with a calesa, or traditional horse-drawn carriage, ride. 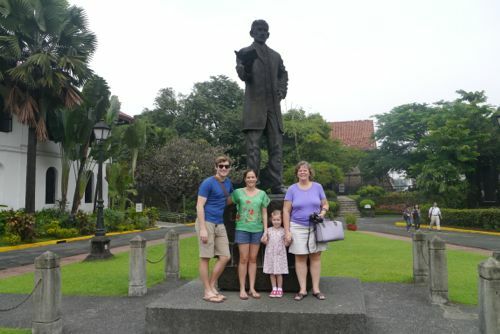 We saw Fort Santiago, and learned about Jose Rizal, the national hero of the Philippines. 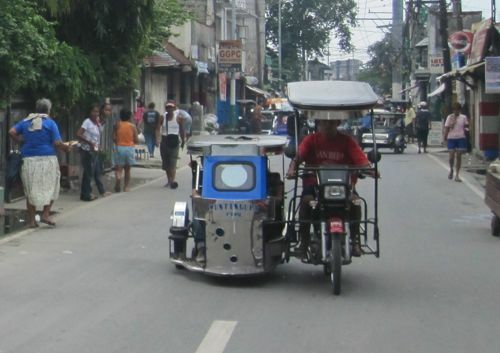 Transportation in the Philippines has it’s own flair. 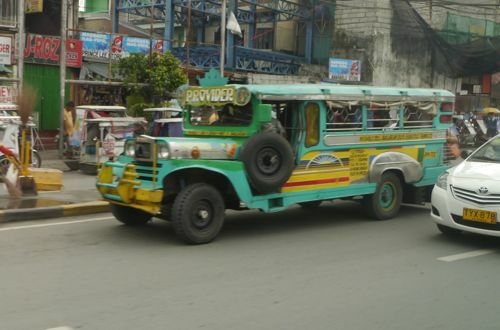 Most famous are Jeepneys, which are like mini city buses or taxis. They are a jeep front with a benched pickup truck back. Originally they were converted US Army Jeeps left in the Philippines after the war, hence the name. They also have a form of a tuk-tuk but they call them tricycles and they are built slightly different. These contraptions are a motorcycle with a sidecar for passengers. In the afternoon we rode to the boy’s school to watch them in action at taekwondo club and for them to show us their school. 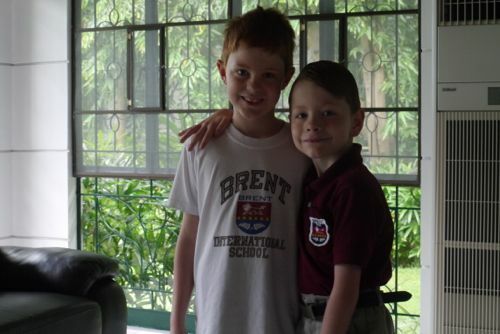 The international school is really impressive with kids from all over the world attending. The grounds and buildings are gorgeous and it seems like such a great opportunity for them to get to attend there. It seemed like they are really enjoying it. Our final night in town Greg and Susan took us to a fancy steak dinner where we thoroughly enjoyed both the food and conversation. The next morning Susan and Ashley dropped us off at the airport and we flew south to explore a few more of the 7000+ Philippine Islands.